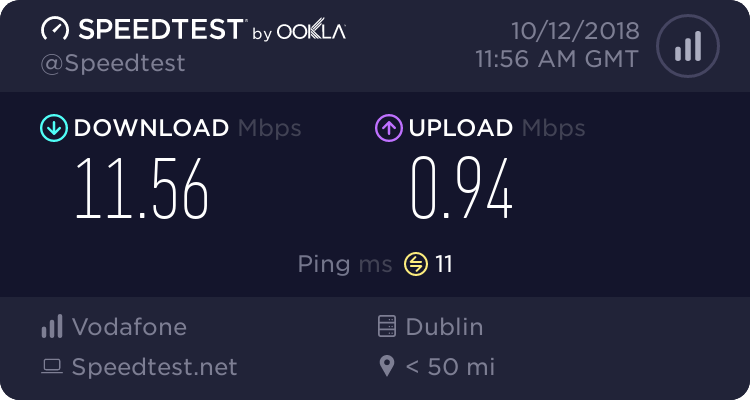 Paying €60 a month for the 'Home Unlimited Fibre IP Voice' bundle. First off its not even fibre and the speeds are very poor for living in a city suburb surrounded by loads of housing estates and an industrial estate behind my house. Is this the best vodafone can do? or could someone please recommend me a better ISP? I would like to be able to watch a movie or play an online game smoothly when others in the house are also using the internet. Thanks. If you're experiencing an issue with your broadband speeds we'd suggest calling our Technical team on freephone 1907 (option 2) when you are at home with your modem available to test as they will be able to troubleshoot this with you directly over the phone. Our technical team are available Monday - Friday 9am to 9pm and Saturday/Sunday 10am to 6pm.